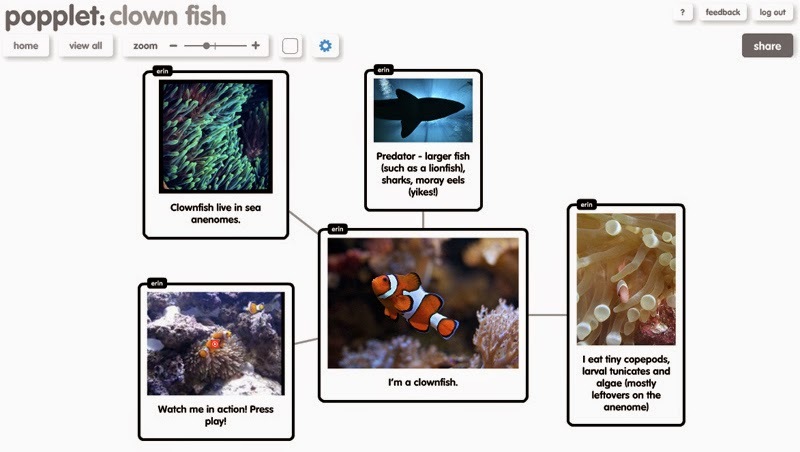 Popplet - Fun, free web 2.0 tool to help students brainstorm and collect their ideas. Students can collaborate or work independently on a mind map. Popplet is great for younger kids because they can insert images, videos, and even draw on their mind map, rather than being limited to just text. It can be used to help students with reading comprehension or organizing ideas for a creative story or factual animal report. Students don't even have to look for images. They can search for an image or video on popplet from flickr, youtube, or their facebook page. If they have their own image they want to add, they can select it from their computer. All they do is select the media they want to include and it adds it immediately. Furthermore, they can add as many "popplets" (boxes) as they'd like!